As you know, we've been making new insurgency missions lately, and now, we've started working on side missions ! But as you can imagine, it's not always very easy to find new ideas, so if you have any suggestion/idea for insurgency side missions, please share ! again not sure if possible, just an idea form my sleep deprived head. From HQ: We have received an emergency call from a friendly helicopter that was shot down near to an area marked on your map. The crew has already been brought to safety however recovering the helicopters black box is of high priority since we believe that it has vital information about enemy movement/positions in this area. We expect numerous insurgent patrols equipped with small arms and possible RPG-threats. Also there is a low possibility that the enemy anti-air gun that shot down the helicopter is close by. We expect the Black Box to be loadable into any vehicle. Recover the Black Box and bring it back to base. 1. Recce marked area on map. 2. Locate the downed helicopter. 3. Remove any insurgent threats in the area. 4. Retrieve the Black Box. 5. Bring the Black Box to the Logistics Center in Base. - Create an area at the Logistics Center that triggers “sidemission successful” when the right object (BlackBox) is moved into the area. - Not sure how big the circle marked on the map would need to be. Maybe 250 , 500 or 750 radius? - Could also add Insurgent QRF Forces ( any technical) that spawns out of view once BLUFOR enters the area. Maybe even word the situation like the chopper got shot down by either a technical or anti air gun. - Could be extended with “Rescue the Pilot” but since we already have a rescue mission I thought that wouldn’t be necessary. - Should work on both maps (fata and takistan). There is a blackbox object in RHS, called rhs_flightrecorder. The enemy has managed to steal a coalition vehicle / piece of equipment. They removed the GPS-tracker, but we can ping the radio transponder and triangulate its position. The missing gear is in enemy hands and needs to be recovered before they can use it against us, our allies or civilians. Expect them to guard and man the weapons they acquired. QRF chance is present once you engage the hostiles manning the equipment. Find the missing equipment and deny it to the enemy by destroying or recovering it. 2. Use the RTD at three different places to create three circles on the map (radius = distance to target). The rough position of the stolen item is where the circles overlap. 3. Reach the triangulated position and reacquire the equipment. 4. If possible, return the equipment to base. - Since it takes quite a while to get to base, pick up the device, triangulate the spot and return the gear to base, the mission expiration time needs to be chosen very generously. - The target gear could be a vehicle (humvee, truck, MRAP, landrover, jackal etc.) or equipment (mortar, 40mm launcher, or simply a crate). - If possible, the mission should yield bonus reputation gain / more precise cache marker if the equipment is not only destroyed but returned. - If anyone finds a better object for the RTD, please share. @Loopy It's technically doable, but I'm afraid it might be a bit boring for the captured player, don't you agree ? If it's the case, any guesses on how we could make more engaging for the prisoner ? @Rev That's a very detailled answer ! Otherwhise, sure ! Working on it ! @Acid Good idea as well ! I'll be working on after Rev's one. Thanks for your submissions ! Not a sidemission per say, but a running task that gives a penalty if players allow insurgents to capture vehicles. If both true then a sidemission with timer fires, telling players to recover or destroy the vehicle. Pretty close to what Acid has suggested, however with this we have a direct connection to our own actions. As a conseqeunce of failing, the vehicle would disappear, enemies get some gear, lowered trust, it could fire Acids sidemission etc. It would make players have incentive to clean up, and could be extended with a penalty if we lose too many vehicles in rapid succesion (so humwee's wont be discarded like plasticbags). Most impactful I believe would be the case of all players down in an area, effectively giving impact to the enemies winning the skirmish, unless we get right back in again. If players return to the vehicle, the notice and timer should cancel. It should not give a reward, because it was ours before we lost it anyway. - A civilian reports the location of an IED and specifically asks for the removal because it is close to his area. Situation will be picked at random, and then, severity of injury (time to complete, objective can be solved/treated/repair car on site y/n) will be discovered by investigation on site. - Protests, harassers. If trust is low, civilians will walk up to the players and get in the way. Players will then need to tell them to "get down" or "go away", to get them out of harm during firefights, but they should return repeatedly, saying stuff like "you killed my son, stop ruining our country, insults etc". Solution is to raise trust again, either by missions or to interact with them multiple times to talk, negotiate, bribe, calm down (should get trust from bad up to baseline again, with a number of attemps relative to how bad trust was, but should not give trust above starting trust). Should complicate firefights a bit, because no matter what, it looks bad on TV if civilians die with NATO soldiers around, and should also fix bad trust spirals of perpetual agony. - insurgents have taken something by force from a civilian, and he has a good idea of where they have a camp, and he will trade the information with the promise for the safe return of what was taken (a goat, food, tools, clothes, crate). mission Would only fire if good trust. information up front, but if the mission is failed, trust plummets. I say camp, but could right now be sort-of very specific information on cache position (a special treat for getting trust up), but if insurgency mission added more types of main objectives, like insurgent training center, HQ, outpost, vehicle depot etc, this could have more diverse use by giving information on the location of any type of enemy position. @Ronberg I like your "peacekeeping and emergency response" mini-tasks, I think we should be able to make them without too much difficulties, I'll be working on them ! @Loopy Yes sure ! Your idea deserve to be discussed ! Not sure what escape way I could add. Please bear in mind that Arma buildings are somewhat "small". Random Camps as in tents plus fire in random spots not really as a mission but a random encounter. How about a mission where the insurgents kill civilians cause they helping our cause. One of the tasks if we don't help them out we lose alot of trust. @Matty Sure I like the enemy camps as random encounters ! Shouldn't be too hard to do as well. It will be up in the next update (ETA right after week end). As for the insurgents intel, considering the number of insurgents we mow down when playing, I'm afraiid they'll be too many corpses to check, therefore making things tedious... How about just giving good intel on those random camps commander corpse ? When it comes to the "save the civs from insurgents" side mission, how doyou see it ? You get a pop up on an imminent massacre in a village, and as soon as you get get there the already present insurgents start shooting civilians ? 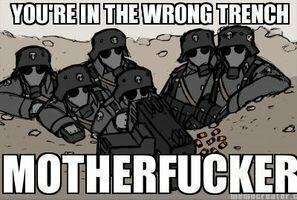 Or you get in the village and then an insurgent detachment attacks ? Popup but it only spawns within lets say 500m of squad commander the area. Insurgents and civ spawn inside buildings and leave them. They start shooting so even the commander can start to hear the firing if you choice to ignore since so close a massive penalty. But it only spawn it if the squad is full so you expect they have atleast 4-5 people with him at the time. And hell its a great place to get intel as well due to increase in civs there. Went on for abit but if that makes sense. And not expecting every corpse to have intel but maybe 1 in 10 or 1 in 15 so its not really you go out your way to check but you might just walk past and go oh intel. And yer camp commanders would also be a good shout.